Masses tend to move with the masses, period. I can only speak about my system and i know clearly the limitations of it, and exposed them on the my darwin presentation. But honestly it's worth what it's worth - Every market moment is unique. Traders are risk takers, investors are "believers" - they believe in the professionalism and behavior of a trading system ( algo or manual - it doesn't matter for this situation ) and obviously look at past performance expecting the system replicate it in the future, but unfortunately doesn't work that way. In my opinion, the ability of trader handle the losses and don´t overtrade/overexpose in order to regain the past losses, is a must, but doesn't happen in the majority of times. Saying all this, investors need to do the homework - I´m nem to Darwinex, but i follow the forum and don´t see in the Darwins threads questions about limitations, expectations, behaviors of the underlying strategies - i think this way investors can understand better the system and probably make better decisions when building their portfolio. Ask questions, as they don´t hurt anyone, and i speak for myself, i´m more then happy to answer them all. For November and December the behaviour of this demo is better than my live portfolio but I designed a new filter that is very promising and i want to forward test it. I slightly modified the filter, the backtest is very similar. After a quarter this portfolio is down -7%. So I will start another experiment. I will start to invest a Top10AUM portfolio. Have you considered keeping a % of your funds in cash just so you could buy some darwins low? I know this is kind of trading but to be honest I am thinking of it more and more lately. Being brakeeven (at best) so far in 2019 is not exactly inspiring.. I am waitng lows on my live portfolio. Waiting lows helps but the main point is finding 5... 10 ... 20 darwins that will return 20% in 2019. If I enter 10 darwins good entries will compensate bad entries. I want to make money because of a good portfolio not because of good entries. I dont' want to be forced to find good entries forever, a good portfolio will walk with his legs. 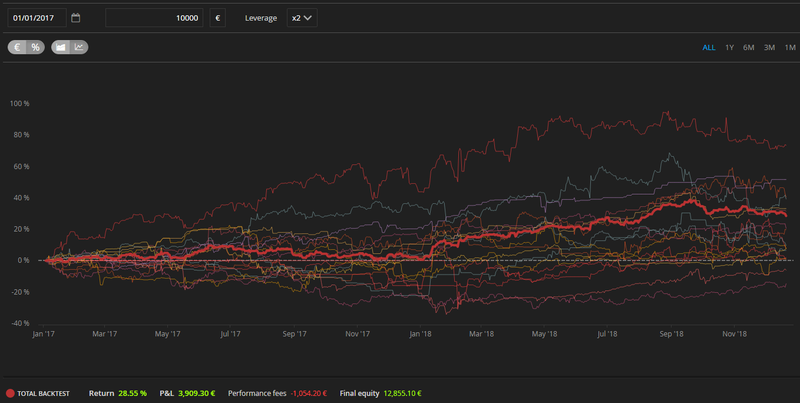 Being brakeeven (at best) so far in 2019 is not exactly inspiring..
On my backtests even winning portfolios have breakeven quarters. Yes, lows on the darwins that you already have in your portfolio and that you trust. The fact is that the first quarter is negative/breakeven -ish and this is coming after a very bad Q4 (for me). You are not worried at this time then? I dont' know but what I know is that it makes no sense to trade darwins. If I want to trade I prefer to spend time on mt4/5 tester developing new stuff. I pay a 20% fee to invest darwins with an edge, not to buy low and sell high. Worried is not the right word, I would say disappointed and a bit tired. 2 years ago I thought here traders were investing each other, unfortunatelly it isn't so. We should be a "community" of traders, instead everyone think to be "the only one" and the others are noobs or scammers. Yes there are many "likes" and kind comments but no investments, money talks! I'm not a trader, only an investor. But I really appreciate all you do here and after watching KVL improve I bought it in November. Unless something radically changes I plan to hold it for a long time. I am trusting 30 colleagues with real money.